Thank you so much for your letter, which has some great requests in it. 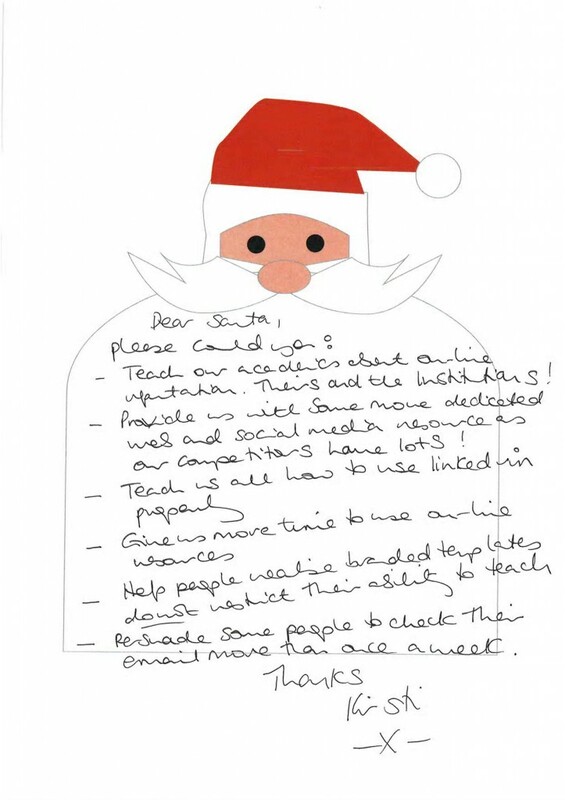 More time to use online resources (or indeed, more time for any number of priorities) is something I am not sure Santa has available right now, but hopefully if we can improve everybody’s ‘digital literacy’ by at least a little bit, it will buy everyone a little extra time. Although, I realise of course that it often just open the door to being able to do something a bit more exciting, which can then take up more time… catch 22. Helping people manage their email (and other forms of communication) is a common request. Again, I think if we can help people find ways to deal with it in a way that stops it from being a terribly time consuming chore, it may help. This in itself can have a major impact on our reputations – both personal and institutional. I think it is a little unfair to lay the blame solely at the door of the academics – I think there are a number of opportunities for improvement in the digital behaviours across the organisation. It is fascinating to see the views of our some of our customers and stakeholders about the ways different parts of the institution interact (or not) using social media. Lots to think about here – and it will be great to build on this conversation further.